Muncie, Indiana BLOG – In my last article on MadJax, I eluded to the corruption within our city administration tainting the makers’ place in the former Cintas project. In order to satisfy upset Guardian Brewery’s executives, city officials decided to loan $460,000 to Sustainable Muncie paying Pridemark for tenant improvements. Normally, these tenant improvements are repaid through the lease. If there is anything we are certain of, politics in Muncie is far from normal. For an administration known for stealing from taxpayers, this is par for the course. Several months ago, I wrote an article about the fallout at MadJax after learning all the original principals were replaced or fired. Some were allowed to resign. Few on the original board remained. Bankers were asked to get involved and once they saw the poor financial statements, they resigned. Last year, the city council approved a $1 million backstop to a line of credit issued by First Merchants. It was spent too quickly with no oversight. Thus, the messed up financials. When the largest tenant, Guardian Brewery was ready for their tenant improvements to begin, there was no availability on the line. Then-president(s) of Sustainable Muncie (Ashley Bane or Michael Wolfe) stopped responding to phone calls. Guardian principals started looking elsewhere for a new home. I’ve talked with one landlord who gave Guardian execs a tour of the facility they had available. Once learning about Guardian being upset, our mayor and his economic development office stepped in. According to loan documents received this past week, Todd Donati used his access to the Muncie Industrial Revolving Loan Fund and funneled $460,000 to Sustainable Muncie to help with tenant buildout so Guardian could open by September 30th. They were supposed to open November 2016. Then when city council representatives asked about tenant improvements, there was a vague response showing Todd Donati had no idea what the norm is or was lying to cover up another arrangement with Guardian executives. I asked the previous president and board member of Sustainable Muncie (Susannah Rosenthal) on June 21st, “Where did the tenant buildout monies come from for Guardian Brewery?” She resigned her position before answering. 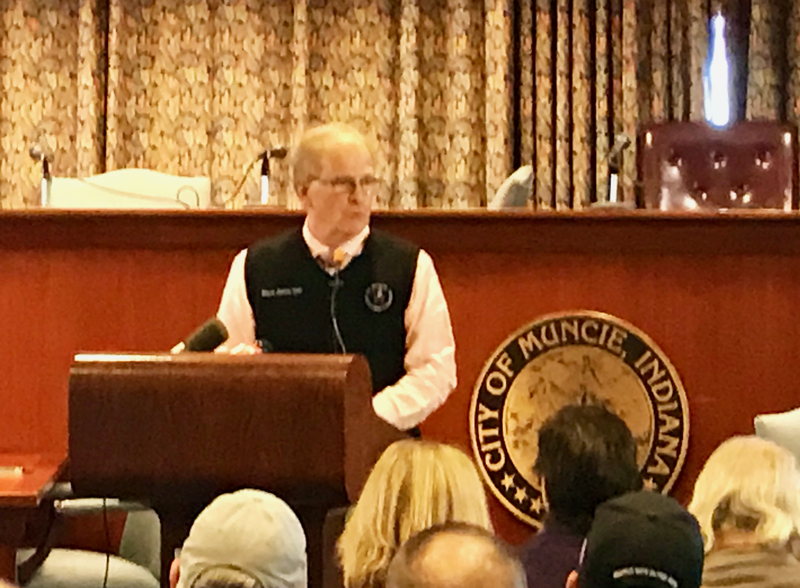 However, after performing a public information request on the $460,000 in loans on Sustainable Muncie’s balance sheet, Susannah didn’t leave until after she accepted a loan from the Muncie Industrial Revolving Loan Fund put through by Todd Donati and Terri Whitt Bailey on May 16th. The loan accrues interest until it matures on November 15th (meaning no payments are due). I guess Todd Donati and the mayor knew they’d be asking for and receiving $4.5 million from the city council four months before it happened. Crystal ball or corruption? For those attending September’s council meeting, each of the democratic puppets who answer to Dennis Tyler and Phil Nichols, all acted like this was a “tough decision” before voting, YES. The current acting president, Jane Ellery, Jennifer Green and Todd Donati refuse to provide the lease to prove the extra $460,000 will be repaid by Guardian Brewery. Guardian executives have been asked three times to provide the lease and refuse. Patrons of Guardian attribute the complaints to local “cynicism”, but pointing out lies and corruption isn’t “cynicism”. I doubt Elm Street and New Corner Brewery appreciate their taxes going to subsidize their competitor. I guess it won’t shock too many readers of Muncie Voice to learn that the FBI is broadening the scope of their investigation. They must be cynical as well.